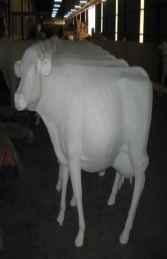 We can now offer our life size cow models in plain white. 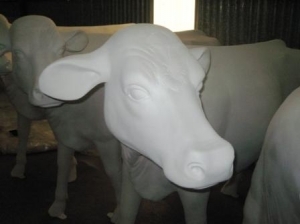 Perfect for creating your very own cow parade at home or at work! Have you seen Jacks Cows? 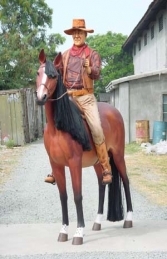 Here at The Jolly Roger we have seen many different cows, just look at our Custom cows or the Jacks Cow Parade. Now we can offer you the chance to surprise us, with your design. Purchase one of these smooth white cows and let your mind run free! 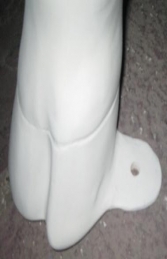 They come supplied to you with a smooth white base coat/primed surface all ready for you to paint as you wish. Perfect if you really want your company or business to stand out from the herd. The Cows hoofs have a metal bracket attached allowing you to fix it down to stop it from blowing over in the wind or being moooved without your permission.